The countdown is on to the release of T-Pain’s new album ‘RevolveR’ later this year, but after visiting our shores recently for the Supafest tour and generally falling in love with the place, the American singer/rapper has decided to give something special to his Aussie fans. 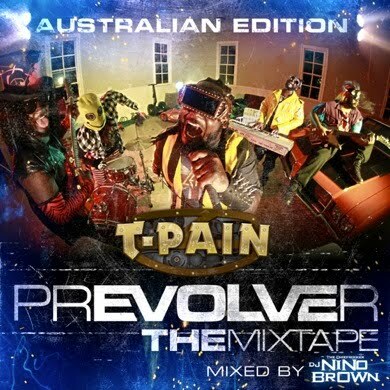 Teaming up with DJ Nino Brown, he’s produced an exclusive Australian edition (pictured) of his ‘Prevolver’ mixtape that’s been doing the rounds all over the globe. The free mixtape features plenty of new T-Pain exclusives, including collaborations with Lil’ Wayne, Bow Wow and many more. And all you need to do to get your mitts on it free of charge is click HERE for the zip!